In 1234, at a shooting range from the historic centre of Kostanjevica na Krki, the Cistercian Monastery Well of the holy Virgin Maria (Fons Beatae Virginis Marie) was founded. It was created by Bernard Speinheim with the wish to strengthen his authority on his new territory on the lower part of the river Krka that boards to Croatia and Hungary. In 1249, with a second founding charter, it gained a leading position over the parish of Kostanjevica and 11 other in the vicinity and so it became the religious, cultural and economic centre in the lower part of Krka. The importance of the monastery for its founder is shown by the fact that his wife and one of his sons are buried here. But there’s no information on whether the founder Bernard Speinheim is also buried here. The monastery contributed to the town development, since at that time monasteries were important generators of nearby towns growth. The monastery grew until the 14th century with the help of various aristocratic families and a stable setting for commerce and progress. The more and more frequent Turkish invasions, the invasions of Uskoks, hunger, the plague, reformation and the development of nearby towns (Brežice, Novo mesto and Krško) were the main factors in the Kostanjevica monastery’s process of losing power. Because of the great influence the monastery had on the town, Kostanjevica suffered the same fate. Only after the Reformation in the 17th century, the monastery recovered a little. But that progress didn’t last long, since in 1785 Josef II with his reforms closed the monastery and all the properties were sold. The building became an administration centre. In 1929, the monastery church was renovated, but in 1949, during the 2nd World War it was demolished. The monastery saw a new dawn in 1958, when Lado Smrekar, the elementary school headmaster, started the renovation of the complex. Forma Viva, the wooden statues freely on display in the vicinity of the monastery, are being created by international artists since 1961. In 1974, the Gallery Božidar Jakac was founded and it’s still managing the monastery complex and hosting various permanent and temporary exhibitions. Various exhibitions found there their permanent home, like those of Božidar Jakac, Tone and France Kralj, France Gorše, Zoran Didek, Bogdan Borčič and the Pleterje works collection of European masters of the 17th and 18th century. The complex is the result of numerous reconstructions and additional work, evidence of a turbulent monastery past. The tri-aisle basilica, that suits St. Bernard’s architecture style, is the oldest part of the monastery church. This church and part of the cross passage are the only two remaining parts of the original monastery complex. The big arcaded courtyard, one of the biggest in Europe, is the result of numerous reconstruction works. The courtyard is encircled from three sides by two-stores tracts with a blind mass of semi-rounded arcades. The oldest western part from the 16th century has a visible stone plaque. The remaining two tracts were made in the 18th century, in the time of numerous reconstructions and additional constructional work. The well in the courtyard centre was built in 1765. 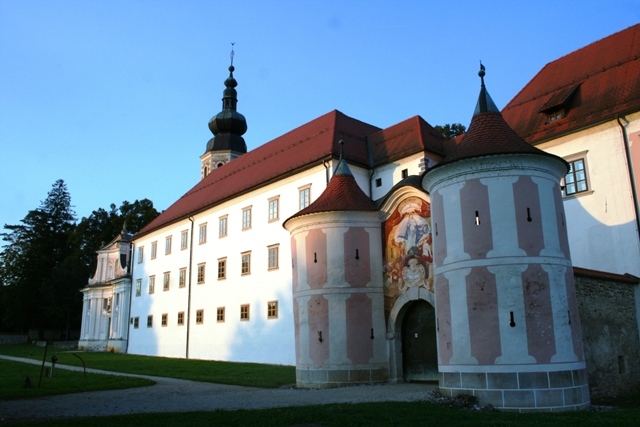 The construction of the main entrance with the two defence towers and the fresco of Maria from 1737 was ordered by the abbot Alexander Tauffer in memory of the defence against the Uskoks attack on the monastery. 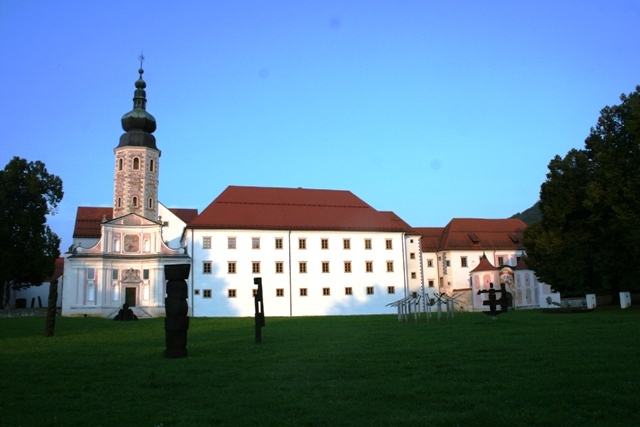 Today, the monastery complex hosts the Gallery of Božidar Jakac with permanent and temporary exhibitions and Forma Viva with wooden sculptures made from English oak from the nearby Krakov forest. In the monastery church also hosts numerous weddings. This place, rich with its history and a note of culture, is a calm sanctuary for people in search of cultural contents and relaxation in a calm place near the stream Obrh.